Sea salt is becoming more and more popular in the world. A large number of people are familiar with the beneficial effects and incredible health benefits that the sea salt provides. It is obtained naturally, and it's healthier than the kitchen salt itself. You can freely consume it in your diet without any hesitation. It is a real treasure of healthy minerals, and has long been used for cosmetic and medical purposes. It cleans the skin, opens the pores, removes toxins from the body and improves blood circulation. Below, find out what are the benefits of using sea salt. Read useful recipes and tips for skin care. What is salt and what is its composition? All salts (even kitchen ones) come from the sea or saline bodies from the water. It is a spice, and a mineral used in human nutrition. What is characteristic is somewhat mildly salty taste. The basic ingredient is sodium chloride. It is gray or white. It is soluble in water, and has a low concentration. It is present everywhere, even in standing waters, and its largest concentration is in seas and oceans. Sea salt has been used as a cure has always and it has a great importance to human life. We need it to survive. In the 6th century, merchants of Morocco traded and valued it as gold. With the growth of civilization, the salt continued to be one of the main items used for trade. Solnitsata was the European earliest known city, and was built around an object for the production of this phenomenal spice. Kitchen salt contains sources of ions of sodium and chlorine necessary for humans and animals. Na ions have an important role in all physiological processes of maintaining normal blood pressure. There are natural, iodized and refined salts. Each of these types has certain minerals that give them a unique taste. What other medicinal salts exist? The rock salt is greyish in, and it comes from the salt mine, i.e. Underground locations. It's exactly where it settles down. Sometimes in these places there were sea or salt lakes. Unrefined sea water is obtained from sea water. It is then refined in special facilities. In the spring, sea water is released into pools that are specially designed. It evaporates and stays on the bottom, and in the autumn months it is used. What is the composition of sea salt? The salt contains about 30 percent of sodium and chlorine 55 percent. These are also the basic ingredients of sea salt. Then there are sulphates 7.7 percent, calcium 1.2 percent and precious magnesium with 3.7 percent. Unrefined sea is considered to be one of the healthiest types of salt on the planet. It is rich in iodine and minerals that are essential for the human body. 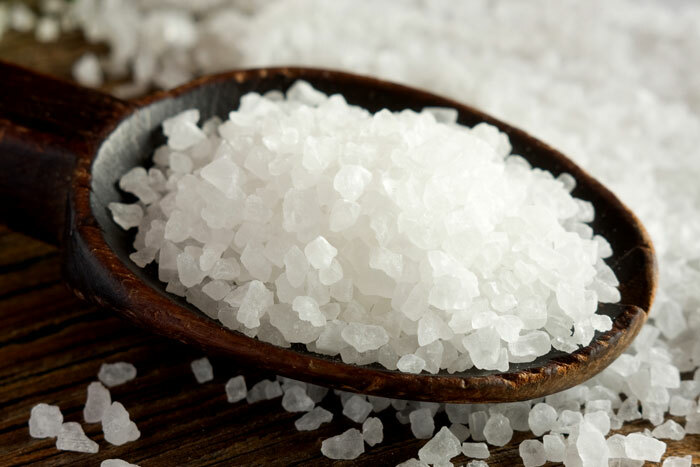 The most demanding and most expensive type of sea salt is Fleur de sel or "flower of salt". It got a name for crystals that look like flowers. This irreplaceable spice has been used for thousands of years, and is also vital to our existence. Usual kitchen salt is considered unhealthy today, and is especially harmful if we exaggerate with its amount. The regular kitchen contains about 60 minerals in it, and the Himalayan and the sea salt up to 84. Certainly, they are a valuable source of minerals. It has become increasingly difficult to obtain the necessary minerals from the food we eat, primarily because of the lack of nutrients in the salt. However, microelements are still present in abundance in the seas and oceans of our planet. From them we get various quality sea salts. Water follows salt, which means if there is too much sodium, water will be retained in the body. The loss of sodium leads to loss of water, potentially causing dehydration and extreme thirst. If the sea salt is taken as a drug every day, you will provide the body with a sufficient level of sodium. It helps to balance the coefficient of sodium potassium. Minimal treatment of unrefined sea salt will preserve most of the natural mineral content. And as you already know minerals such as sodium, calcium, magnesium and potassium are absolutely essential for strong immunity. In the natural way, the sea salt helps as a cure for fighting against viruses, fever, allergies and flu. Salt electrolytes have important functions - regulate heart rate. In moderate amounts, it can help to avoid electrolytic imbalance. Did you know that sea salt is ideal for inhalation? When used with water, salt can help reduce high cholesterol and blood pressure. It is important for regulation of irregular heart rhythm. It prevents the onset of atherosclerosis, cardiac and stroke. Sea salt from the Dead Sea effectively provides therapeutic relief to patients suffering from rheumatoid arthritis. Studies have shown - these valuable salts have anti-inflammatory properties and have shown significant progress in the above-mentioned diseases. Potassium helps correct muscle functioning. In the sea salt there are less quantities of this mineral, but it helps the body to absorb it better than other foods. It is effective in preventing pain in the muscles and cramps. Of essential importance for the proper functioning of the brain, muscles and nervous system is sodium contained in unrefined sea salt. Sodium is also a water regulator in our body and transmits electrical signals. How to use sea salt for the sinuses? The doctor's recommendation is to take sea salt for sinuses through inhalation, especially if they are inflamed. It will help you when breathing and cleansing sinusoidal channels. In addition, it has no side effects. Heat the large sea salt in the pan. When it gets a mild gray color and starts to jump, it is then ready for use. Now wet the kitchen cloth and then squeeze it well. Put hot salt on a cloth and make a pillow shape. Watch it's hot. You'll see the steam coming out of the cloth. Get another kitchen cloth and put it on the forehead and a pillow over it. This is done every night before bedtime until the symptoms of sinusitis completely disappear. Your teeth hurt? - We have a solution! If you are suffering from toothache and have various other dental problems, stop them with sea salt. It contains fluoride, which is useful for the health of teeth. Protects against damage and prevents the development of caries. Regular rinsing with lukewarm salt water softens the wounds in the mouth, tongue, bleeding of the gums and pain in the throat inflammation. Did you know that sea diets are very important for diabetics? It helps maintain the level of sugar in the body and reduces the need for insulin. It is essential if you suffer from this unpleasant illness. The sea salt consists of a similar assortment of minerals and other elements, as well as those found on the skin cells. It is a completely natural ingredient that is used for therapeutic treatments and cosmetic products. Mineral salts from the Dead Sea are especially appreciated and required due to the effect of skin rejuvenation. Bathing in the solution leads to freshness and revitalization. Studies have shown that the anti-inflammatory effect is transcribed by the presence of high magnesium content. It also helps in detoxifying the body and flushing toxins from the pores and improving blood circulation. This is also a natural remedy for the treatment of psoriasis. Treatment leads to significant improvements in patients suffering from a variety of skin diseases such as skin itching. Do you know that our bodies contain the same concentration of minerals and nutrients as seawater? It is no wonder that the sea salt is a natural ally that protects the body and skin. People who have problems with the pimples and acne know best that they tied many things to get rid of this problem. Mix two tablespoons of salt with 4 tablespoons of honey until you get a thick paste. Apply it evenly on dry skin and clean face. Avoid areas around your eyes. Leave them some time to rest 10 to 15 minutes. Rinse the cloth in hot water and gently squeeze out. Place a warm coating on your face for 30 seconds. Gently rub your fingers with circular movements while washing your skin lukewarm water. The sea salt helps in cleansing the pores and stops the bacteria from which the acne and pimples develop. 1 teaspoon of sea salt is mixed with four deciliters of warm water in a small bottle with a pump. Wait until it dissolves. Sprinkle on clean, dry skin, avoiding eyes. Use once or twice a day. Sea and olive oil are a great combination for your skin. Together they make a gentle scrub that removes dead cells. They contain important minerals that soften the skin and restore hydration. Mix 4 tablespoons of sea salt with 125 ml of olive oil in a thick paste. If you want, add 10 drops of your favorite essential oil. Apply it on the sponge or palms while you shower and lightly rub your skin with circular movements. Try a peeling that has a rejuvenation effect. The sea salt for face softens the skin and restores hydration, while the aloe vera feeds and heals. On the other hand, lavender is a mild anesthetic that increases circulation. Mix half a cup of salt together, with a quarter of pure aloe juice or gel. Then mix a quarter of a cup of oil and 1 teaspoon of dry lavender flowers, and 10 drops of essential oil of lavender. The resulting mixture should form a thick paste, if it is too dry, add a few drops of oil. Apply it in the shower and lightly rub the skin in a circular motion. 2 tablespoons of cream and 1 tablespoon of large sea salt, mix well and lubricate the body. Lightly rub it, then rinse it with lukewarm water. There will be an immediate effect on the skin. It will become soft and gentle. Do you know how to use sea salt for hair, and in what way it stimulates new hair growth? Massage daily head with salt and improve scalp circulation and strengthen the follicles. Use natural sea salt solution. This ingredient absorbs excess fat and moisture, prevents the growth of fungi and prevents dandruff. Wet your hair and add one to two spoons of salt on the scalp. Use your fingers and gently massage the scalp. Wear it for about 10 to 15 minutes. Then rinse your hair and wash it in a normal way with your usual shampoo. The result will be immediately visible. The sea-water spray has gained popularity lately because salt draws moisture and natural oils. This is one of the simplest recipes for natural hair care made at home. It will add a large volume of cuts without the use of harmful chemicals. If you do it yourself, you can also adjust it to the type of hair to get the texture you want. Get a hair spray bottle. Put hot water in the spatter bottle and add sea salt (1-2 spoons) and other ingredients. Close and shake for 1-2 minutes until it is completely dissolved. Store in the refrigerator if you use lemon juice. Shelf life is 3-4 months or longer. It is also possible to use strong tea from chamomile as a basis if you want to refresh your hair. Cellulite is a great enemy for almost half of the women on the planet. It is difficult to remove it despite numerous preparations that are on the market. But also the unrefined sea has found its place. It can be used in the form of salted massage or baths. Mix with oil of rosemary, lavender or olive oil and mash on problematic places. You will stimulate the circulation in the subcutaneous tissue and eliminate all unnecessary toxins and leads to tensile skin. Regularly use it and notice that the orange skin slowly disappears, and you will also lose weight. You have problems with depression and insomnia? Sea salt against depression also showed its effectiveness. If you are tired, unwilling and constantly sad, be sure to use it. It helps preserve 2 basic hormones in your body that allow you to cope with stress more easily. These are melatonin and serotonin that will help you feel good and relaxed. Mix a little sea salt and baking soda, then apply on a toothbrush. This beneficial toothpaste removes stains and beautifies your smile. It contains a natural source of fluoride, which is a bonus for your gums. Mix the salt and 2 tablespoons of baking powder and apply to a wet brush. Wash your teeth regularly. If your taste is too strong, try to mix your toothpaste with this mixture. You will get an excellent natural remedy for disinfecting your mouth because you will kill bacteria that cause bad breath and gingivitis. Use healing baths once a week. To make it as effective as possible, dissolve 350-450 grams of sea salt in hot water. Add cooler water to achieve the optimum temperature. Get in the tub and relax. Accelerate the effect - you can add essential oils such as lavender, or melissa oil for more relaxation. To stimulate the circulation of the skin and the whole organism, the oil of rosemary is the right solution. In the period of colds and viruses, you can add the eucalyptus or incense oil. Sea salt from Dead Sea is great in alleviating bloating in tired eyes. Salt complexes help to reduce the darkness and relax dark bags. Enjoy yourself in the right way - make a detox bath that will refresh the entire body and make you shine again. 1 cup of apple vinegar. Mix the dry ingredients and put in a jar and leave in a dry place. Use for each bath and mix with hot water a cup of this ingredient with a glass of vinegar. Enjoy your bath, spend about half an hour in the water. This incredible mixture will remove toxins from the body and eliminate pain. This bath is used when you have problems with circulation, fungus, sore feet. Refresh your legs with a cup of sea salt, 3 drops of mint and 2 drops of lavender oil. If you suffer from chronic fatigue, mix one spoon with 2 drops of lemon and 3 drops of white pine oil. Does it cause side effects and is it allowed for consumption? Although the sea salt is medicinal and has a beneficial effect on health, do not overdo it, use it moderately. If you overdose it will result in an increase in sodium, and then more water is secreted through the kidneys. This leads to complications with the balancing of other essential electrolytes. Symptoms of excess sodium are abdominal flatulence, lethargy, dehydration, nausea, irritability and muscle twitching. Hypernatremia occurs when there is an imbalance in sodium and water in your body. This condition is more common in babies who have low intake of breast milk or a formula that has not been mixed properly. Elderly people have this condition often, especially if there are problems with kidneys and diabetes. It affects people with severe burns and those who take diuretics. Symptoms include intense thirst, headache, confusion, irritability, anxiety and drowsiness. If you notice these signs, be sure to ask for medical help. So far, we have heard that unrefined sea is better for us than ordinary kitchen salt. With all the different types of market, how will we know which one to choose? Are there any differences and how to spot them? Which is better sea or kitchen salt? Product of sea water evaporation. Minerals are intact after the treatment. Very little additives (depending on the brand). It does not stimulate fluid retention. It is available in white, pink, black or gray. Product of underground salt deposits. The minerals are removed by processing. It contains additives such as, MSG, processed sugar and aluminum. What is identical with both types? Both contain iodine. Whatever type you prefer, we recommend that it be within the normal range of about 2,300 ml daily. Pregnant women who have problems with the cold can without any hesitation use a Himalayan saline solution for the nose. You have a lack of iodine in your body - learn how to make Lugol's solution. I had problems with the pimples during pregnancy. It looked ugly, and it was pretty bad for me. I used sea salt scrub while showering, and the pimples disappeared right away. I.B. For a long time I suffered from rough skin on my feet, my heels are completely rough and cracked. I heard about peeling my feet with sea salt, I had to try it out. I put it on the glove with salt on it laid it in the tub, and slid along it like I was whipping the floor. It felt great! I definitely will buy sea salt again. It softens my skin and I'm in the sandals again. M.V. I like to clean old jewelry with sea salt. I have plenty of stones and crystals and it helps me in that. I mix it with a little cold water and soak them overnight. Now they are all shining and I'm really happy with the results. Try it, too. J.O. This beneficial spice can be found in various forms. You will find it in health food stores, markets, online. For sea salt, the price depends primarily on the product and the manufacturer. Unrefined and refined salts are quite different, and this largely influences the price. Our recommendation is to use less those refined ones. As for example, the Himalayan, which is increasingly popular today. Refined large salt you will find at a price of 1.5 dollars per Kg. The average kitchen salt costs is about 50 cents. The Himalayan is something more expensive and you need to extract about 3 dollars per 1 kg. If you liked this article, we recommend an earlier article from the Diet's blog about the health benefits of Himalayan salt.